It's easy-to-learn and easy-to-play. Here is an opening for Black which will furnish good results in the shortest possible time. Which other opening could we be referring to apart from the Scandinavian or Centre-Counter Defence; 1 e4 d5 ! International Master Andrew Martin has written extensively on the Centre-Counter and here he turns his attention to 1 e4 d5 2 exd5 Qxd5 3 Nc3 Qd6!? Playing flat out for the win against 1 e4 is never easy, but here we encounter a variation where Black can do just that! All relevant second and third move alternatives for White are covered too! 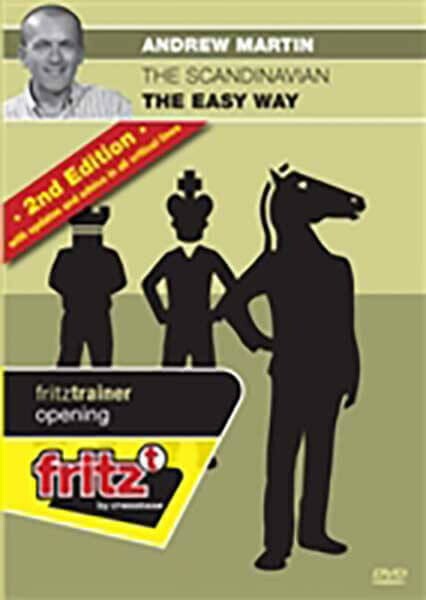 This DVD will be a boon to all chessplayers,but particularly to the busy person with limited time for study or those who wish to incorporate a new defence into their Black repertoire with the minimum possible hassle. This really is the Scandinavian - the easy way! Since the first edition of this DVD, the Scandinavian with 3...Qd6 has become very popular. Rightly so, because it ticks a lot of boxes for the competitive chessplayer. Important games are being played in this line frequently all over the world at all levels. In this new,updated version of "Scandinavian, the easy way", Andrew Martin casts his eye over recent trends and offers solutions for Black in the critical lines. He reworks 3...Qd6 and modernizes the variation where necessary. Black can still play 3...Qd6 with confidence!